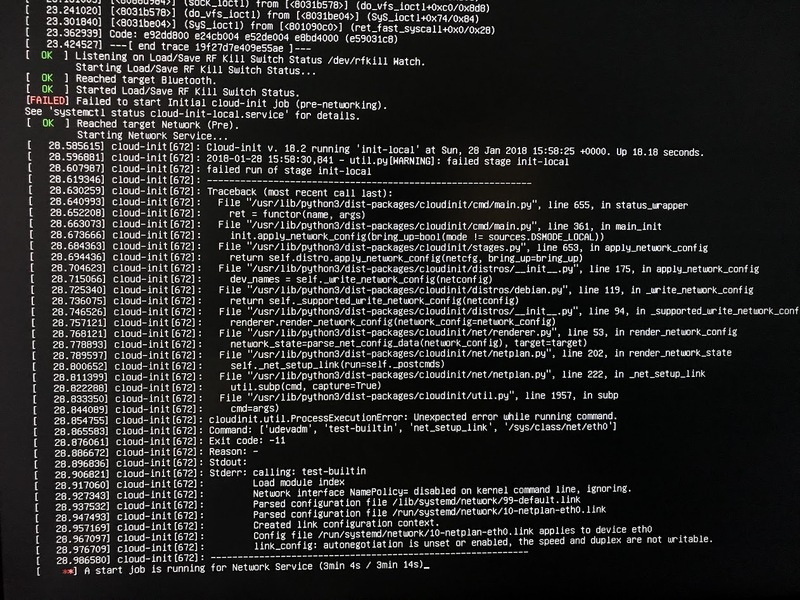 Has anyone been able to get the ubuntu-18.04-preinstalled-server-armhf+raspi2.img.xz on a Raspberry Pi 3B+ working according to these instructions: https://wiki.ubuntu.com/ARM/RaspberryPi ... B.2F3B.2B-? I have followed them and restarted 10 different times, and I can't get past the cloud-init pre-networking job. I have an ethernet cable plugged in. I've tried disabling several cloud-init and network service settings to no avail. This is my first time trying to get Ubuntu 18 running on a Pi, so let me know if there is anything I need to provide. ubuntu-18.04.1-preinstalled-server-armhf+raspi2.img.xz and to configure its file system. • Erase all contents of the SD card and format it with the FAT file system. • Use etcher (or similar product) to burn the .img file onto the SD card. ◦ The first partition (system-boot) contains the Linux boot loader file system. ◦ The second partition (cloudimg-rootfs) contains the Linux root file system. • Open the system-boot partition and delete everything except for the config.txt file. • Open a terminal and cd into the Downloads directory. • Copy ALL files in the boot folder (including the overlays folder) of raspberrypi-firmware-1.20180910 into the system-boot partition. • Create a folder called deb_files and put all the .deb files you just downloaded into the deb_files folder. • Delete the Raspberry Pi 2 machine & Raspberry Pi 3 machine, replacing them with the Raspberry Pi 3 Model B Plus machine. • Save the reconfigured file once finished. • Dismount the SD Card. If you encounter the following message, "Volume is busy. One or more applications are keeping this volume busy", Press cancel and do not eject anyway. Try to dismount periodically until the volume will allow the dismount. • Place the SD card in your Pi and turn it on! • You will be prompted to change the password once entered. • You should see wlan0 (wifi). ▪ If you see a return of Wireless Access Points, you’re ready to configure your netplan file and connect wirelessly. • Your current netplan file will look like this (or similer to). ▪ upon reboot, you may encounter a "Start job" with no limit. Be patient, the system will boot. MAC Address. You are now connected. Last edited by z3n on Mon Oct 29, 2018 1:10 am, edited 5 times in total. Thanks for writing such a comprehensive guide! I'm having trouble accessing the second partition referenced in your doc (cloudimg-rootfs). I'm using the LTS image referenced in your doc as well as a number of other variants from the Ubuntu site, but can't seem to get the second partition to mount correctly. I am using a Mac. I've tried several different SD cards (new from package) and also installed FUSE on the Mac in case the filesystem for the second partition was not recognized. Sorry if this question has been answered before, I just couldn't find it. Any help very much appreciated! The easiest, headache free way to get started is to (Using your Ubuntu 18.04 LTS Operating System) format your SD card with the FAT file system using the Disks application, and then use etcher to put the server image onto the SD card. Once etcher has the server image on the SD card, re-open the Disks application and mount your SD card from there. Then, open your file browser and you should see the cloudimg-rootfs and system-boot partitions. If something isn't working for you in the terminal, you may have to improvise by jumping out into the GUI. If you encounter anymore issues with the installation and configuration, don't hesitate to let me know and I'll assist the best I can. I hope this helps. A few days ago I've made a preinstalled image for myself, with all the drivers, dtbs, etc. It's working fine, so maybe it could be useful for some of you. Thank you very much! Following your detailed instructions I have successfully installed Ubuntu 18 Server on a Pi 3B+. I have an issue which I don't think is normal. I can not simultaneously ssh in to the Pi with the LAN and WLAN. Which ever is loaded first grabs the ssh and in order to use the other I need to either physically disconnect the ethernet cable or ifconfig eth0 down. # the datasource. Changes to it will not persist across an instance. I was able to boot my Pi 3B+ by the pre-built ARM image above .... However, it seems that I am stuck with the wifi. no configuration screen pops up after the upgrade. I do not know if this is relevant for the following. During installation II was able to scan the SSIDs in the area, including mine, and configure the netplan accordingly. The wlan0 is correctly listed by ifconfig, but of course not connected. Any idea about what could have gone wrong...? thank you in advance for any help!.